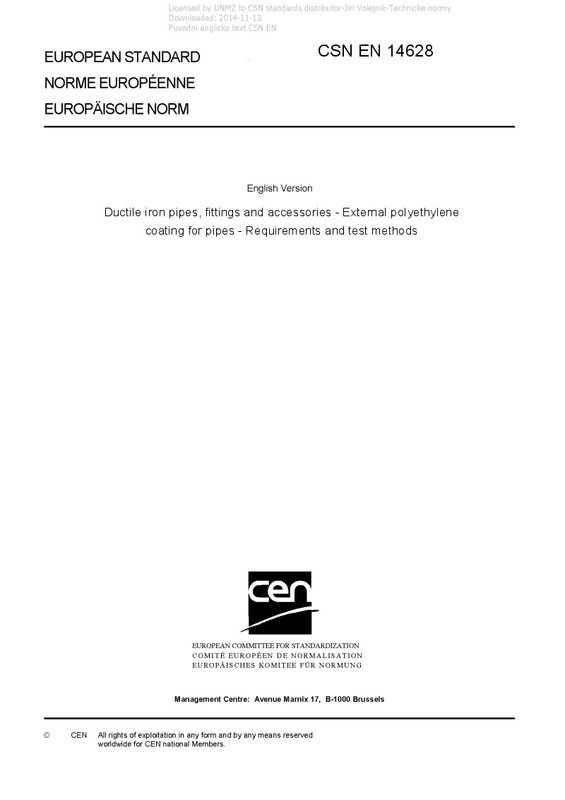 EN 14628 Ductile iron pipes, fittings and accessories - External polyethylene coating for pipes - Requirements and test methods - This European Standard defines the requirements and test methods applicable to factory applied extruded polyethylene coatings for the external corrosion protection of ductile iron pipes conforming to EN 545, EN 598 and EN 969 for use at operating temperatures up to 50 °C. This European Standard does not cover ductile iron pipes protected with thin PE sleeve. Special works at site like drilling, tapping etc. may influence the corrosion protection properties. Those job steps shall be included in the instructions of pipe saddle and accessory manufacturers and all other essential installation instructions. These instructions are not part of this European Standard.